This one’s an oldie but a goodie. It was one of the first dishes I made when I first bought Forever Summer (which was the first Nigella book I’d ever bought), and it was the first dish that was a complete and utter success with my family… it inspired such confidence in myself and in my ability to cook. I hadn’t made it for a while (you know, low carb diets and all), and having recently seen Nigella make it on TV, I thought it was time to give it another go. The recipe serves six, generously. I thought we were going to have leftovers, but in the afternoon I decided to invite my friends Frances and Ed to join us for dinner. 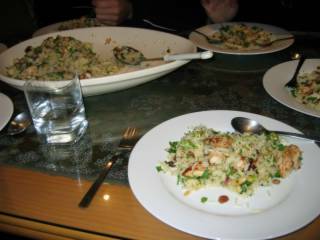 The pilaf comprises bite-sized pieces of fried, marinated chicken meat, which are folded through basmati rice cooked in chicken stock (home-made too!) with pine nuts, almonds and cashews. 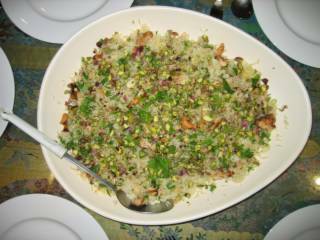 Then you sprinkle chopped pistachios and parsley over for added taste and vibrant green. I also add sultanas to this dish, because I love the middle-eastern combination of sweet fruit in savoury dishes. It's a bit greener than you might expect - because I was very generous with the parsley and pistachios. Yup. 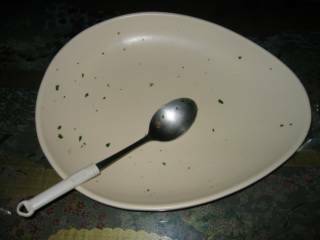 We finished it. Damn tasty. And Frances brought over a poppyseed strudel for dessert. Yum. I would like to make Nigella's Honey Semifreddo for dessert the next time we have this, which will have to be when Uncle Cheok comes to stay... partly so he can try one of our favourite dishes, but mainly so we can share the calories.